Are you looking for a better workout? Dumbbells and kettlebells are an amazing way to make a training routine more difficult, but there are plenty of other types of equipment at the gym. What do you say about a medicine ball? If you think that exercises with a medicine ball are easy and ineffective, you are wrong. It's time to find out exactly what these exercises are! A medicine ball is an amazing way to strengthen the core, since it allows you to easily move and balance the weight in ways dumbbells may not. The main advantage of a medicine ball is that it comes in different weights and sizes, so even if you're just a beginner, you can find a medicine ball that fits your needs. Fitness experts claim that medicine ball moves can help you get a flat belly as well as tone up your body and build strength. That is why, in order to sculpt beautiful and fit body, you should perform a medicine ball workout routine. We would like to show you five wonderful moves with a medicine ball that focus on strengthening abdominal muscles, core and back. You should pick up two or three moves and add them to your training routine, or you can perform three circles of this workout to get noticeable results. 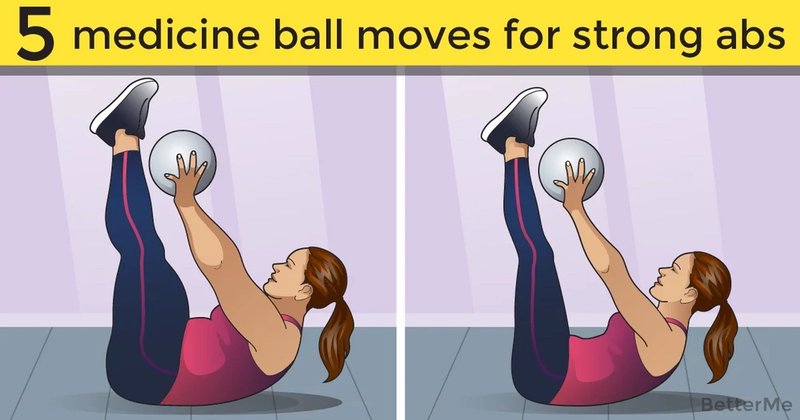 If you want to build a lean, flawless figure, you should perform these medicine ball exercises three times a week. Before you start your workout, it’s important to perform a five-minute warmup in order to prevent bone and joint injuries. Are you excited? Scroll down to see how to perform these moves correctly. It’s time to work out, ladies!